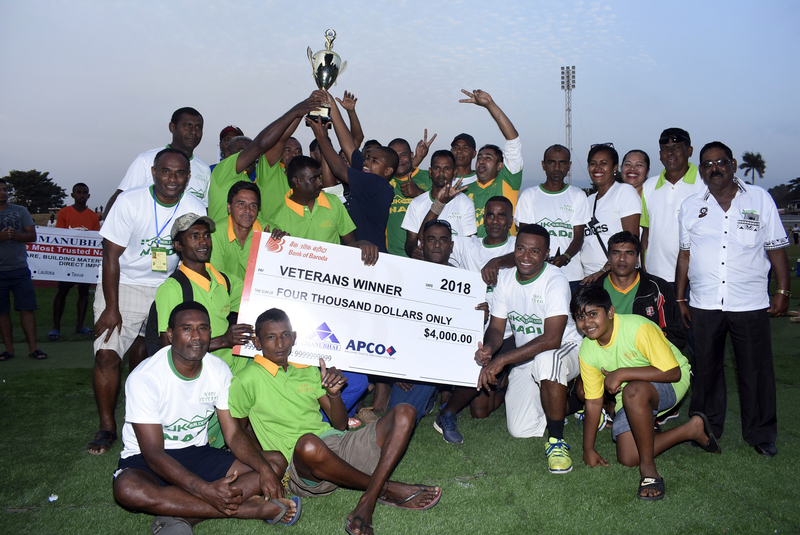 The JK Builders Nadi Veteran’s successfully defended the RC Manubhai/APCO Coatings Fiji International Veterans tournament title at Churchill Park t after beating Tavua 1-0 in the final. Striker Prem Junior netted the winner for the legends of Jetsetters who boasted the likes of goalkeeper Waisiki Batina, Ponipate Naulu, Watisoni Voli, Maika Waqa, Emosi Baleinuku, Sairusi Niulevu, Timoci Matanitu, and Maika Kasami while Tavua had the services of former Ba and national defenders Valerio Nasema, Malakai Khenehewe,Sikeli Qaugau,Lisala Bontuba,Manasa Drua, Waisea Duwai,Senirusi Bokini and Aplimeleki Vunisa. The Lambert Sarju coached side earlier in the day overcame Rewa 3-1 in the semifinal while Tavua overcame Ba Legends 2-1. And in the quarterfinals, Nadi defeated NZ Labasa 2-0, Rewa over Rakiraki Legends 1-0, Tavua beat Suva Masters 2-0 and Ba Legends registered a 1-0 win over Nasinu. Nadi walked away $4000 richer while Tavua received $1500 for reaching the final. Nadi midfielder Maika Kasami, who was instrumental in all their matches, was named the Player of the Tournament while goalkeeper Waisiki Batina was named the Best Goalkeeper of the Tournament. Subash Chand of Rewa was awarded the Oldest Player of the Tournament and Ba’s Lorima Batirerenga scooped the Golden Boot Award.